As I announced last week, and reiterated yesterday, today we are here to launch this brand new series about freelancers and professionals working in the world of languages and its related fields. Here you are! This is your lactose-free latte. If it is ok with you, I am going to ask you some questions about yourself ranging from daily life to something more personal. I will share it on two different appointments. This is the first part. 3… 2… 1… Ready? Go. ▷ Valentina Ambrogio – that’s it! But my mom has given me many nicknames over the years, such as Valeria, Valery (said in French), Tabellina (meaning “little table” – I was good at math, hence the nickname), and many others. ▷ Freelance Audiovisual Translator and Localiser. ▷ April 4th (4 is my lucky number, of course). ▷ I live in Rome now, but I was born and raised in Reggio Calabria, southern Italy. ▷ A manager or anything involving the English language. ▷ Neither. Milk + coffee is my thing; as for tea, I can’t stand the smell. ▷ Both  But walking in the woods makes me feel a little bit more connected to nature. ▷ I can play guitar, but I’m no pro, still have to learn a lot. I have always wanted to learn how to play the piano, but I never got around to doing so. ▷ A plan. I need to know what to do and in which order, even if it’s just a visit to the museum. ▷ I enjoy cooking, but let’s just say I would never win MasterChef. I don’t think I have any specialty. I can bake simple cakes and they usually taste good, does this count? ▷ Heels? You spelled it wrong. It’s HELLS! Nope, nope, nope. My feet are good where they are, touching the ground. ▷ I like them, but I don’t have a favourite one. ▷ Basically anything by J. K. Rowling and Les Fleurs du Mal. Now I’m reading It’s not me, it’s you by Jon Richardson. ▷ I’d say I fall into this spectrum. ▷ I am a PC owner, but I wouldn’t mind having a Mac. I love my iPhone and Apple products in general – so sleek! ▷ iOS. My iPhone understands me. ▷ Facebook, as it allows to show who you are on different levels. ▷ Crash Team Racing for PS One. Yes, not the best title of all times, but I had the time of my life playing it with my brother when we were little. It has a special meaning. Who’s Valentina? ▷ Valentina is a freelance English to Italian audiovisual translator and localiser based in Rome. 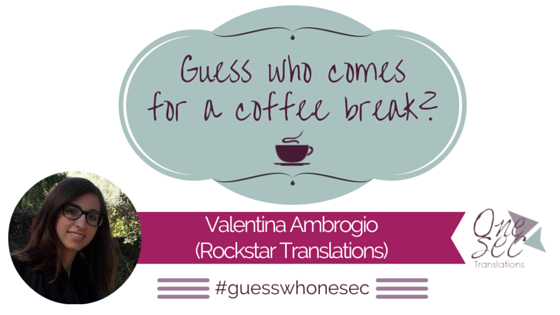 In 2013 she founded Rockstar Translations and in 2014 started her blog “The Translation Cauldron“. Anglophile, Potterhead, Whovian and hopeless TV-series addict. You can find her on Facebook, Twitter, LinkedIn and Instagram.